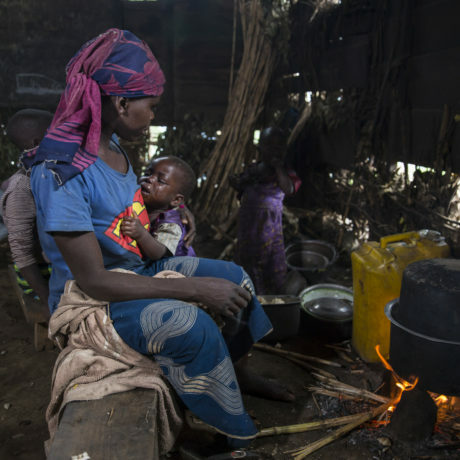 Ongoing conflict in the Democratic Republic of Congo has forced more than four million people to flee their homes, and more than eight million need humanitarian assistance. In this second installment of our “Off the Grid” series, we expose one of the world’s worst humanitarian crises. Translation: That which is known, that which is out in the open, does not cause pain, nor does it bring torment to anybody. For decades, one of the world’s deadliest, longest-running crises has been unfolding in the Democratic Republic of Congo — and yet you’ve probably heard almost nothing about it. In this latest entry in our #OffTheGrid series, we’re trying to change that. On October 30th, World Food Programme Executive Director David Beasley stepped forward to raise the alarm: some 3.2 million people in the Democratic Republic of Congo’s (DRC) conflict-ravaged south-central Greater Kasai region are severely food insecure, struggling to feed themselves and in urgent need of assistance. It’s just the latest urgent chapter in DRC’s tragic history. Today the country is in the grips of a massive, under-reported humanitarian crisis that spans well beyond Greater Kasai, the product of years of chronic ethnic conflict, political instability, and neglect by its own leaders and the international community. Even if there were no conflict, the most basic obstacles to development abound. Comparable in size to all of Western Europe, DRC’s vast geography is characterized by low population density and expansive forests. 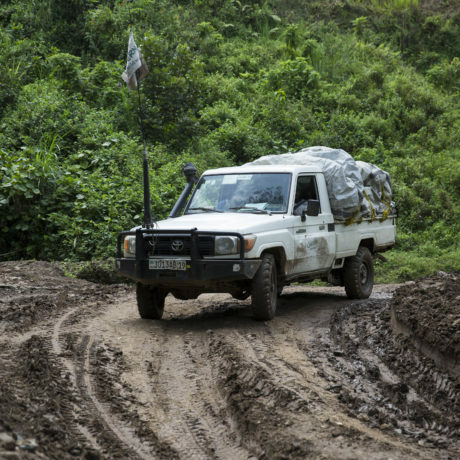 According to the UN, there are only about 1,400 miles of paved road in DRC, and just over 9,000 miles of unpaved road, which are frequently impassable during the rainy season. 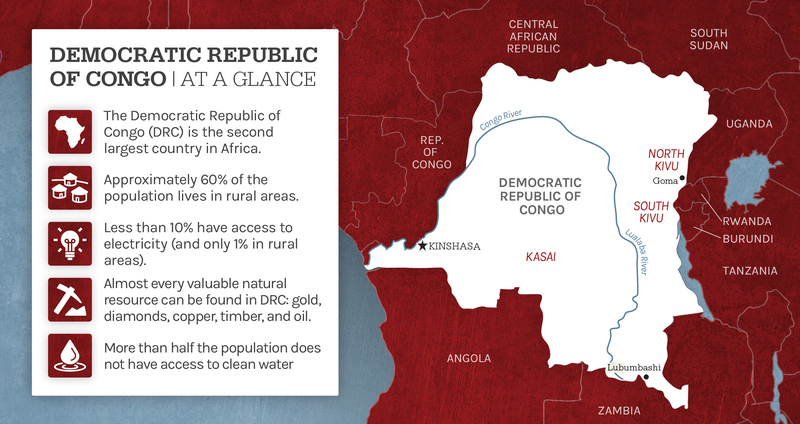 Despite economic advantages, DRC is one of the world’s poorest countries. Paradoxically, its potential wealth is vast as well. The country has 80 million hectares of cultivatable land, and large reserves of diamonds, gold, copper, cobalt, zinc, and coltan, which is used in mobile phones and other electronics. Despite these economic advantages, DRC is one of the world’s poorest countries, ranking 176 of 187 on the UN Human Development Index, with 54 million of its 78 million people living in extreme poverty. The roots of this paradox lie in centuries of exploitation and violent plundering by colonizers, leaders, private interests, neighboring countries, and internal warring factions. 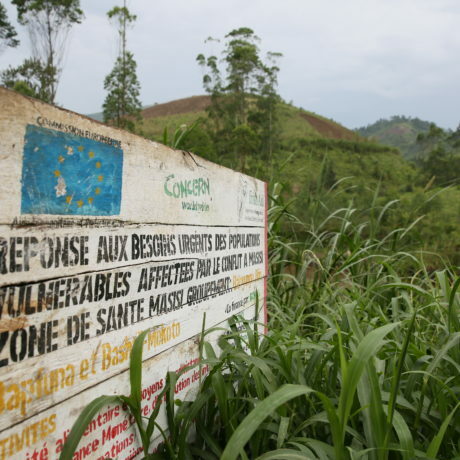 We take a look at DRC's history of conflict and instability fuels the crisis there today. Most of the country is literally “off the grid” — only 10% have access to electricity, a figure that drops to only 1% in rural areas, where most of the country lives. More than half of the country — a figure as high as 50 million — doesn’t have access to clean water, and currently it’s in the grips of one of the worst cholera epidemics in the last decade: more than 27,000 cases have been recorded and the death toll of almost 600 is on the rise. In total, the disease is impacting 20 of the country’s 26 provinces. On top of continuous violence in DRC’s east, a new wave of violence is overtaking the Kasai region, in the south of the country. In 2012, Jean-Pierre Pandi became chief of the Dibaya territory in Kasai — a stronghold of the main political opposition party. In DRC, chiefs hold a large amount of power and administrative control. While they aren’t political positions, they are recognized by the government. When Pandi was killed during clashes between his fighters and government forces, a full scale-conflict erupted. Since then, 1.4 million people in Kasai have been forced to flee their homes. Read the story of Nyirakama Bakenga Jeanne, a young mother of five struggling to survive in a conflict zone. Working with displaced, conflict-affected families and vulnerable households in conflict-scarred North Kivu province. These families are effectively consigned to a life of displacement, unable to return home due to the ongoing conflict. We distribute emergency relief items, such as tarps, hygiene items, and jerry cans, while also helping people recover through access to cash, assets, and livelihoods opportunities. Working in Katanga province in the southeast in some of the poorest and hardest to reach communities. Leading a consortium of five international non-governmental organizations in a five year water, sanitation, and hygiene program that directly reaches more than 600,000 people in 692 villages across DRC. 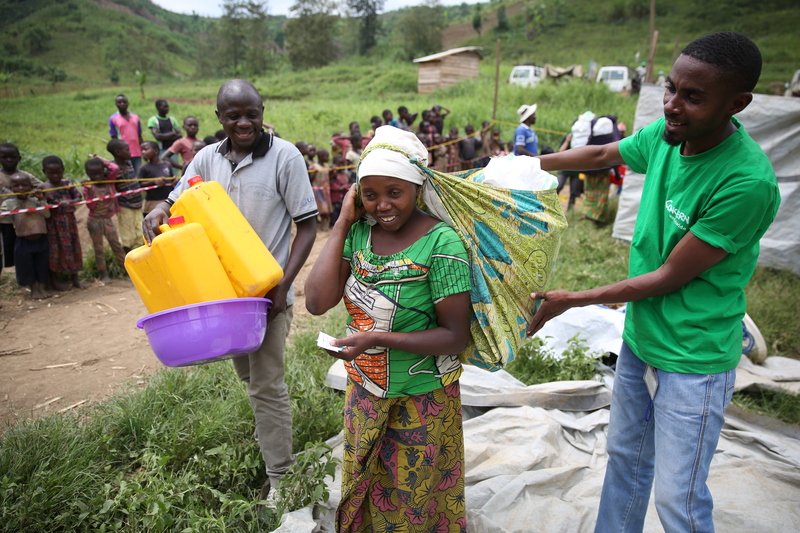 Supporting more than 61,000 people with an emergency water, sanitation, hygiene and shelter response in the Tanganyika province where violence has displaced more than half a million, and neighboring Haut Lomami, epicenter of the cholera outbreak. Implementing an emergency cash transfer response supporting 1,000 displaced families in Lomami, Greater Kasai. Maintaining a head office in Kinshasa, the capital, for the purposes of coordination with other organizations and advocacy. Take a look back at Concern's more than two decades in DR Congo, which began when it was still called Zaire.